Just about everyone loves a great Halloween party. Even people who don’t like to wear a costume love Halloween parties because they get to see what everyone else is wearing! However, nobody likes to plan it because picking a theme can be challenging. We’re going to help you by discussing some of the best Halloween party themes around. While you’re still planning your party, it’s important to remember the importance of great background music. You need to set the tone to help everyone get in the mood to enjoy the festivities. Here are some of our favorite Halloween party themes, along with tracks of ambient music that will be a perfect fit. This is an old Halloween theme, but it’s a good one. Let your guests dress up as ghosts, goblins, vampires and bats with a Haunted House theme. They can mirror the vampires from Twilight, the witches from Hocus Pocus or the characters from The Rocky Horror Picture Show, or any other scary person (or thing!) you might find in a haunted house. Many of the most popular movies over the last decade are about super heroes. That puts the super hero theme at the top of any list of good Halloween ideas. Of course, you are liable to see Superman and Batman, but you might also find out who the real comic book fans are when your friend show up as one of the more obscure super heroes. You can even extend the theme and tell people to come as the person who has been their own personal super hero and inspired them at some time in their life. One of the most popular shows on television these days is The Walking Dead, which makes zombies a cool Halloween party idea. You can celebrate the start of the new season of the tv show and the holiday all at the same time with a zombie Halloween party. You know your friends and co-workers have been dying to see what they would look like as a zombie. As an added bonus, you can hire a makeup artist and let people get their faces made up as part of the fun. Who doesn’t love a great cartoon! 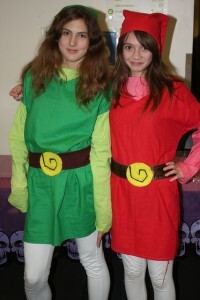 Cartoon characters are a great idea when you’re looking at Halloween party themes. You are liable to see anything from Mickey Mouse to The Simpsons… and everything in between. You might even spot Popeye or The Little Mermaid! Have you always wanted to have a holiday party in December, but have never been able to get it organized because of everything else that comes along at that time of the year? One of the more unusual Halloween party themes out there is to have a Halloween party that is focused Christmas. People would never dress up as elves or a reindeer for your year-end holiday party, but they might do it for a Halloween party! You might even get to see Saint Nick. One of the tried-and-true options when looking at great Halloween party themes is to dress as your favorite movie character. Not only will you get some great costumes at your party, but you might get some great insight into your friends and co-workers. You may even find out that your mean neighbor is actually a big fan of Clarence from It’s a Wonderful Life! Now you have some great Halloween party themes, just ready for you to pick one of them. Decide which one is your favorite, send out the invitations, and start picking out the background music that will set the tone and ensure your party is a huge success.